Two years ago, Fernando Torres would have expected to start a Champions League semi-final. He was a frequent international goal-scorer, a fan-favorite, and Liverpool’s run-away star. Now he’s just a chronically lethargic, over- priced flop. Torres signed for Chelsea because he thought he might win something. Little did he know that his arrival would coincide with the decline that has been obvious all season. Di Matteo’s team is, essentially, a poor-man’s version of the Chelsea of old. The club have abandoned Villas-Boas’ lofty attacking principles and reverted to the defensive style preached by Jose Mourinho, largely because the marquee players whose signings was intended to elevate Chelsea to Barcelona’s stratosphere have disappointed. David Luiz is a liability at the back, and Torres is a hollow, lifeless version of his former self. Andre Villas-Boas was hired to facilitate a transition at Stamford Bridge. He was a youthful innovative coach; change was his MO. But his revolution has been half-baked. Villas-Boas signed young stars like Mata and Lukaku, but he couldn’t dislodge the core of Mourinho’s team: Cech, Terry, Lampard and Drogba. Josh McEachran, instead of easing into the Chelsea first team, was loaned to Swansea where he has struggled for playing time. Chelsea’s midfield is dominated by functional, dogged defensive types, players like Essien, Ramires, Romeu and Mikel. Miguel Delaney on Barcelona-Chelsea. Still worth a read, even after the first leg. David Hershey selects his Premiership Team of the Season. Jason Burt on Roberto Di Matteo and Chelsea. David Yaffe-Bellany’s latest Fantasy Football advice column. Dave Taylor on Del Piero and Totti. Check out our Blog Roll (bottom of the site) for more excellent football coverage. “The essence of Chinaglia’s world is style” wrote Sports Illustrated’s J.D Reed in 1979. “He’s the guy who orders dinner for everyone in Chinese restaurants.” Chinaglia, who died last Sunday of complications from a heart attack, was a dogged striker, prolific on both sides of the Atlantic. To his fans, his endearing on-field ruggedness more than offset his penchant for smoking cigarettes and womanizing. Chinaglia was an insufferable human being, but it was impossible not to love him. 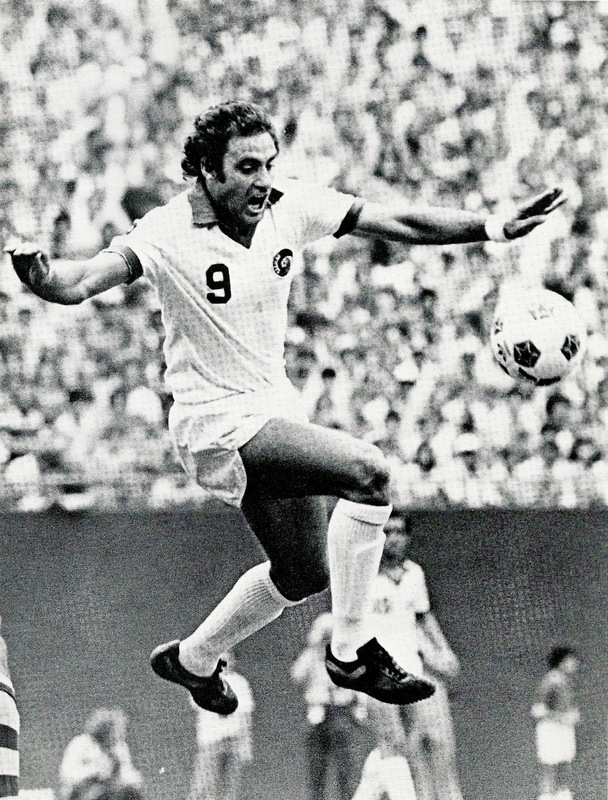 Born in Italy, Chinaglia moved to Wales with his family at the age of six. In his early teens, he was scouted by Swansea Town (now Swansea City), but he made only a handful of appearances for the first team. Even in his early years, he was volatile: supposedly, he once attacked a Swansea City coach with an ax*. While that particular anecdote may be apocryphal, it is certainly true that the Welsh coaching staff disliked Chinaglia; indeed, they told him he would never make it as a professional footballer. Undeterred, Chinaglia moved back to Italy, settling in the quaint quarry town of Massese. By 1966, Chinaglia was playing regularly for Massese’s local third-division side — a tough, functional club reliant on catenaccio. The forward would later credit his devious marksmanship and unremitting bravery to his experiences in the lower tier of Italian football.